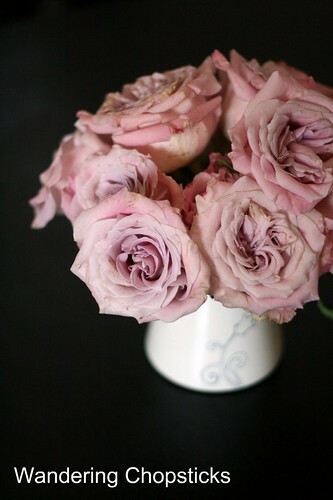 Roses salvaged from a wilted centerpiece from cousin D's wedding. September was a busy month. I reconnected with my college roommate, celebrated my cousin's wedding with the family, celebrated Pablo's 2nd birthday with the family, and had jury duty at the same courthouse as the trial for Michael Jackson's doctor, Conrad Murray. Luckily work slowed down a bit this month to make room for all that activity. After busy, busy August and working 12 days in a row, I still wasn't in the mood to cook. Too many things had been neglected around the house in the meantime. 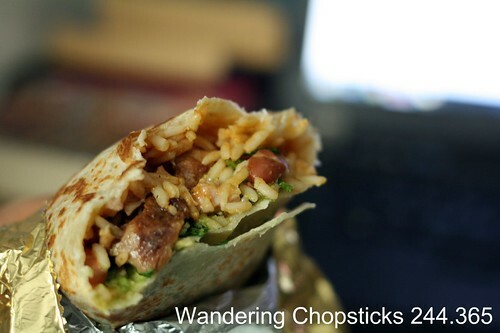 I am a sucker for coupons so when I saw the pictures of El Pollo Loco's chicken poblano burrito, I was too tired not to take advantage of it. And seriously? Best $4 I'd spent in a long while. Lil' sis got a new puppy. An Alaskan Eskimo. So cute and white and fluffy. The niece loved it so much that she wanted to touch it through the computer screen when they video-chatted. 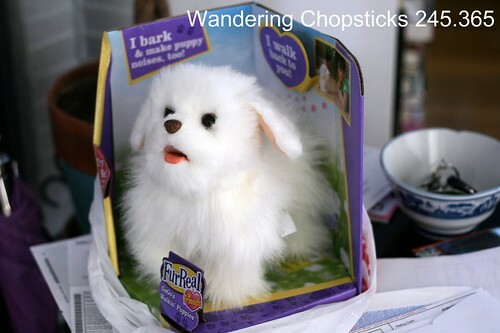 So my dad asked me to buy an electronic dog that looked like lil' sis's puppy for him. He said I wasn't allowed to give it to the niece ahead of time. That it has to be a gift from him. 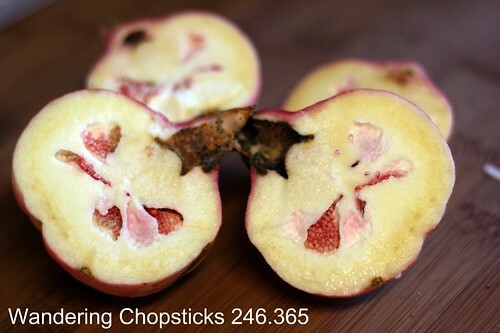 I picked the few pomegranates I had on my tree and they turned up empty. :( Then I made Cha Gio (Vietnamese Egg Rolls) and reshot the how to pictures since they were so crappy the first time around. Who knows when I'll get around to updating the post though. 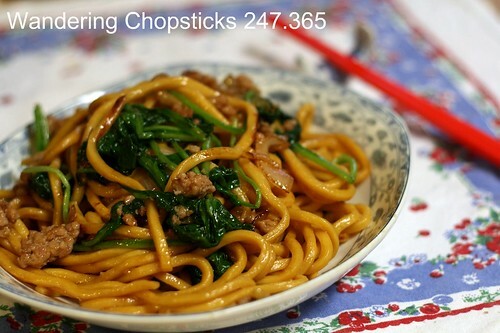 Shanghai Noodles with Ground Pork and Spinach. Finally! 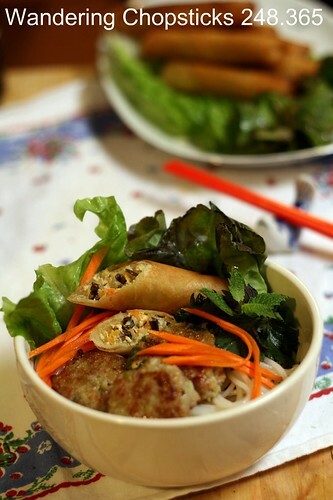 I was in a mood to cook and made Cha Gio Chay (Vietnamese Vegetarian Egg Rolls) and Nem Nuong (Vietnamese Grilled Pork Patties), which I turned into Bun Nem Nuong Cha Gio (Vietnamese Rice Vermicelli Noodles with Grilled Pork Patties and Egg Rolls). My Vietnamese vegetarian egg rolls were so good, and I had so much filling left over, that I made them again the next night. 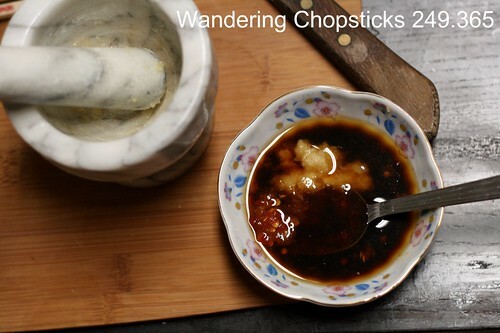 This time, I decided to make Nuoc Cham Xi Dau (Vietnamese Soy Dipping Sauce) to dip it in for a complete vegetarian meal. 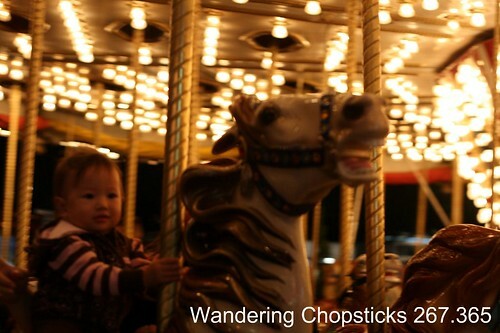 My Wandering Chopsticks Facebook page hit 500 fans today. Whoohoo! My college roommate was in town so I met up with her in Little Saigon at Quan Vy Da Restaurant - Westminster since she said she had a craving for either Bun Bo Hue (Vietnamese Hue-Style Beef Noodle Soup) or Bun Rieu Cua Tom Oc (Vietnamese Rice Vermicelli Noodles with Crab, Shrimp, and Snails) and I said we could have both here. 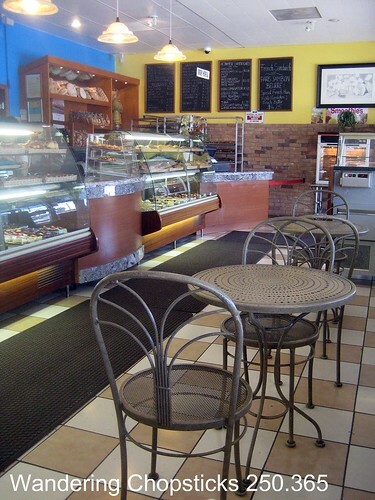 Afterward, we went to Boulangerie Pierre & Patisserie - Garden Grove to get dessert and to catch up some more. I last saw her when I lived in Chicago almost a decade ago and recently reconnected with her on Facebook. As the afternoon lingered on, we stopped off next door at Nuoc Mia Vien Tay - Garden Grove for some fresh squeezed sugarcane juice before moving to Brodard Restaurant - Garden Grove, not really to eat since we were too stuffed, but so she could get a few things to-go. I picked my last few pomegranates and finally got one with seeds. Then I quickly made some Ca Kho Crock Pot (Vietnamese Braised Fish) since I had to pick up my parents from the airport. I figured by the time we came home, dinner would be ready, but my dad said we always go to my youngest aunt's house for dinner when they come into town. I said my aunt didn't mention it when I saw her the night before, but sure enough, youngest aunt invited us over. So my mom and I ate the fish for breakfast. I tried to make my Shanghai noodles for lil' sis, but the store didn't have any left, so I used fat chow mein noodles, but it wasn't the same. I haven't done a thorough restocking grocery trip in a while and missed wandering each shelf to find new stuff. Like this cassia flower jam and osmanthus paste. What do I do with that? Anyone know? Are they for baking? I literally had 30 minutes for lunch in between two appointments. 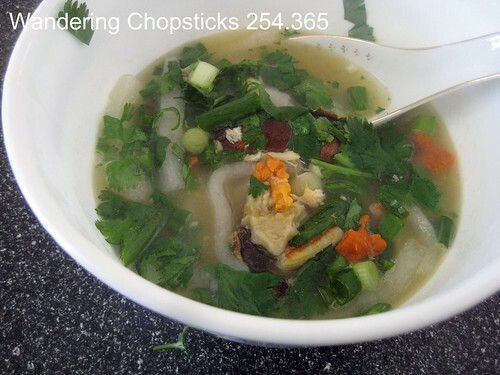 So I raced to youngest aunt's house where my mom was making her banh canh cua (Vietnamese crab noodle soup). My mom wasn't quite finished when I arrived, so she spooned it into two bowls so it would cool faster. I only had time to gulp down one before I had to get back to work. Even though she saved me a bowl later that evening, the first one while the homemade noodles were fresh and the crab was plentiful was the best. The only time I know it's a Vietnamese holidays is when my oldest aunt sends over food. This time, it was snowskin mooncakes and egg rolls for the Mid-Autumn Moon Festival. And I still had a few leftover macarons from cousin D's wedding. I had to go to the grocery store again because my mom was making her banh xeo (Vietnamese sizzling pancakes). You can tell my mom's banh xeo are the crispy ones in front. The yellow ones in the back are from a mix. With the extended family gathered, I gave Pablo his birthday present early because I figured it'd get lost amongst everything on his actual birthday. 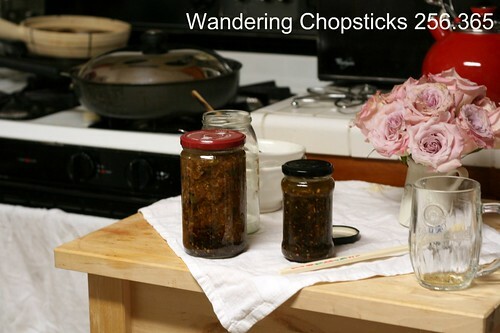 Shortly after midnight, I finished making homemade XO sauce and put it into jars for my mom to take up to Oregon. That evening, I made apple turnovers for my ong noi (Vietnamese paternal grandfather)'s death anniversary. 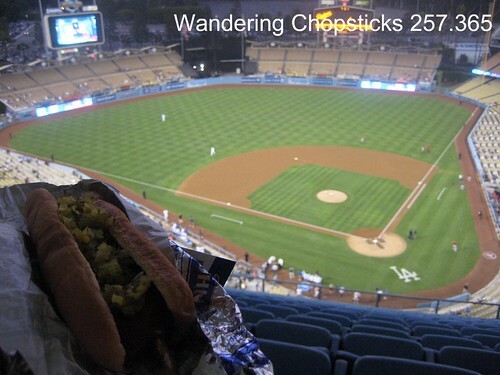 I saved up my receipts from filling up at 76 and scored four Dodgers tickets. I gave away a pair to one of the fans on my Facebook page and used the other pair to go with Gourmet Pigs. My verdict? Dodger dogs were boring, but the garlic fries were awesome. Oh, I was supposed to watch the baseball game, you say? Ha! 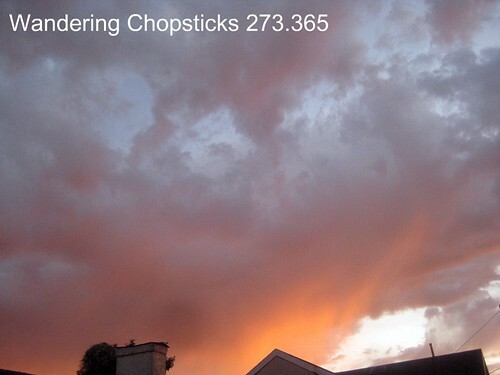 On day 258, September 15, 2011, I finally finished blogging my last few November 2007 posts. 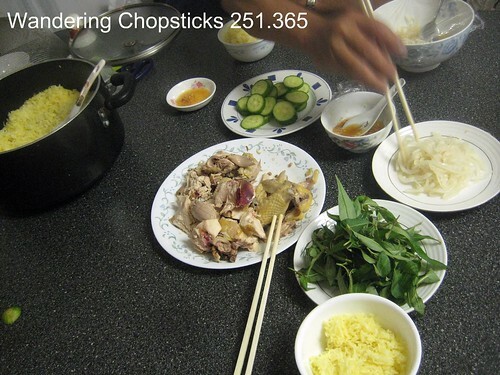 Back when I used to blog much more frequently, a reader requested to come over for dinner to learn how to cook. 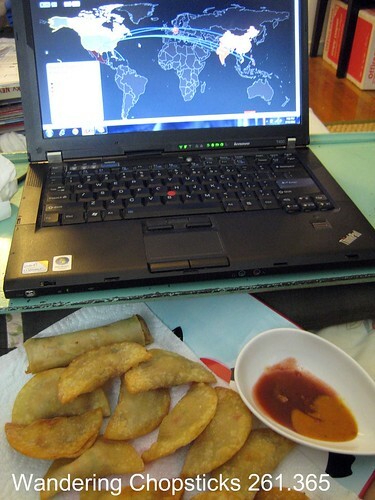 I was actually chatting with friends on another website about our dinner plans. It was so disconcerting that I didn't blog for weeks. Nonetheless, I promised myself I would finish those old posts eventually and so I did. 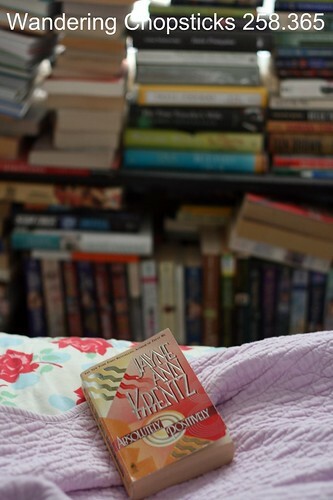 While cleaning out my bookshelf, I stumbled upon Jayne Ann Krentz's "Absolutely, Positively" and just had to reread it. I had forgotten how much I enjoyed her quirky characters. I enjoyed it so much, it made me go back through and pull my favorite Amanda Quick novels. Same author, in case you didn't know. 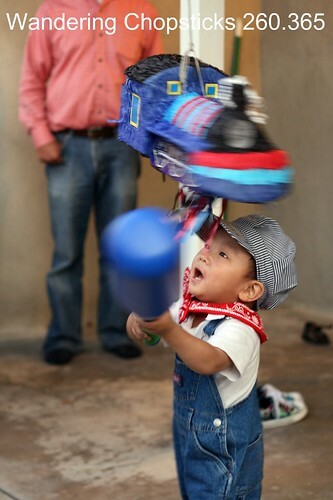 Pablo's 2nd birthday. What a cute little train conductor. I made Crab Rangoons for Pablo's birthday party, and had some left over so that was dinner. I discovered this Migration Map, which is the coolest thing. Click on any country and it'll tell you the number of arrivals and departures. For instance, why are there 323 Vietnamese people in Greenland?! Have you been waiting all summer for new shows to premiere too? Alex O'Loughlin is so pretty. "Hawaii 5-0" isn't really my thing, but I've been following him since "Moonlight" and "Three Rivers." 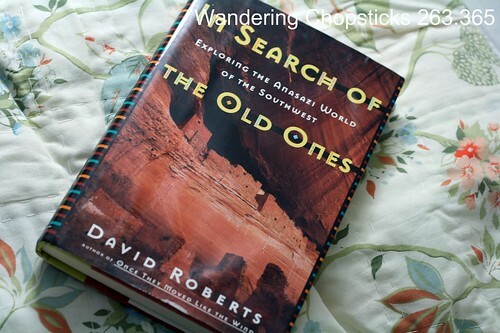 In finally blogging my trip to Mesa Verde National Park - Colorado, I stumbled upon mention of "In Search of the Old Ones: Exploring the Anasazi World of the Southwest" by David Roberts, which made me curious enough to read about it further. 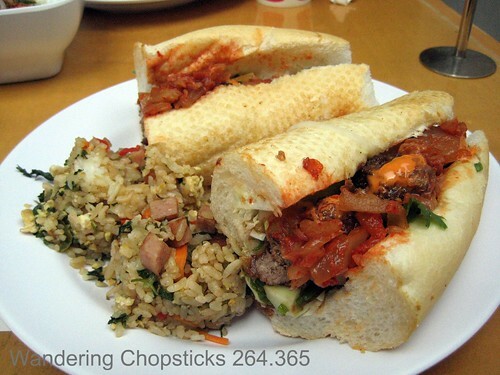 I met up with Jin of Slate Food for lunch at Starry Kitchen - Los Angeles. Such a fun lunch. 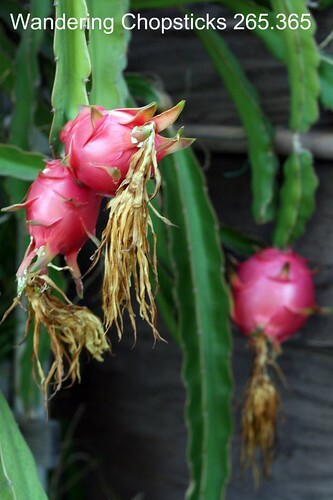 Without even noticing it, my dragon fruit ripened and were ready for eating. I'd been too busy all summer to monitor it as closely as I usually do. 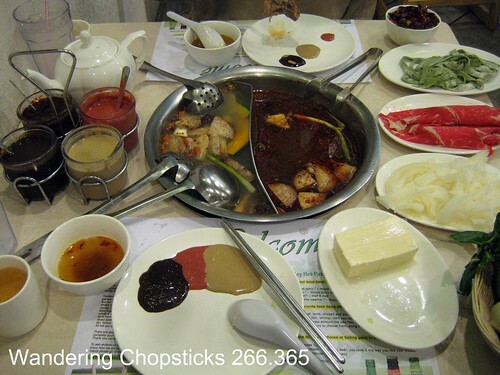 Had dinner with my friend DP at Hot Pot, Hot Pot!, which took over the old Little Fat Sheep - Monterey Park. She wouldn't believe me when I said the mild was quite spicy. 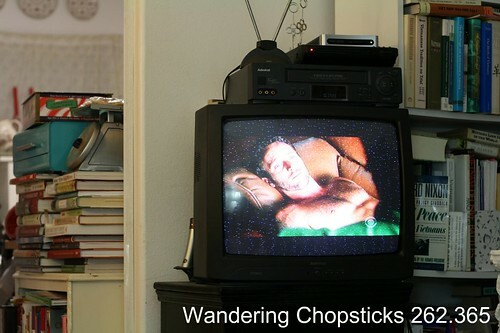 So when it came out, she immediately scooped out that bowl of chilies you see in the upper right. I got four free tickets to the LA County Fair and took my brother and his family. The niece loved it. All those lights! The adult merry-go-round and slide were a little too scary for her though. So we moved over to the children's area. I've told you before that my brother loves chicken necks. Well, apparently like father, like daughter. While waiting for my brother to finish glazing his roast duck, I picked at the neck to tide me over. I gave some to my niece and she couldn't get enough, pointing at me to give her more. So I gave her the whole neck. 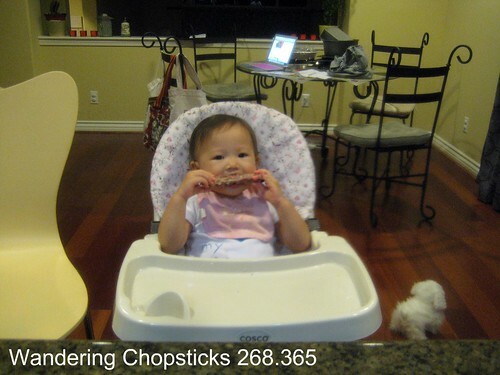 She leaned back in her high chair to get comfortable and went to town, munching on it down to the bone. Haha. 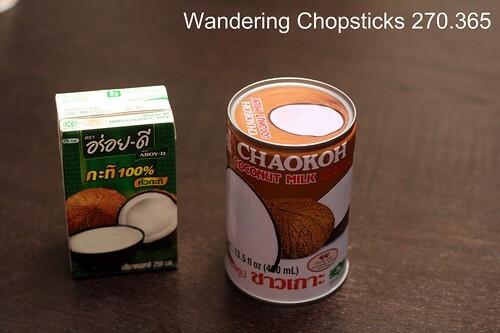 What is up with the price of coconut milk? 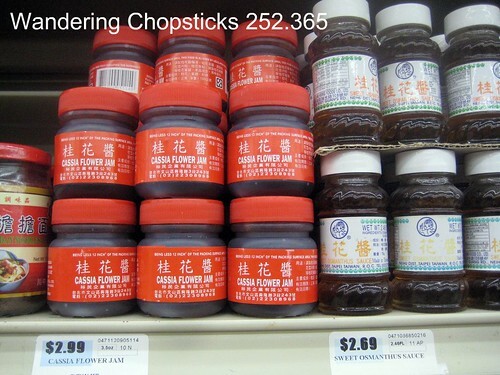 While grocery shopping, I noticed that it's nearly doubled? 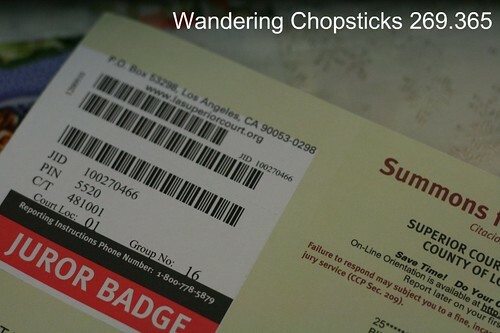 Had to report to Los Angeles County Superior Court for jury service. 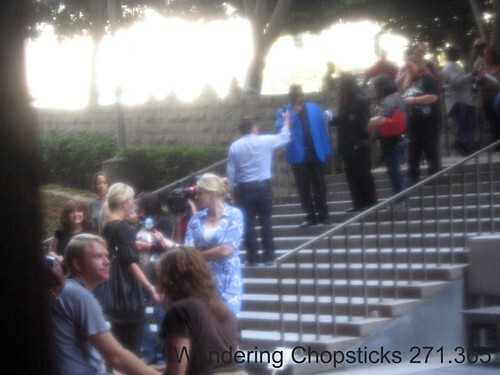 The Dr. Conrad Murray trial was taking place in the same building. It was a madhouse with reporters, camera people, picketers, a Michael Jackson impersonator, and I'm pretty sure, one of the Jacksons. Tito? Jermaine? My point and shoot camera had to pick today of all days to get a weird smudge that I couldn't wipe clean. But I figured the fuzziness just added to the whole surreal experience. My childhood friend said I should have met up with her for lunch while I was on jury duty since she works downtown. 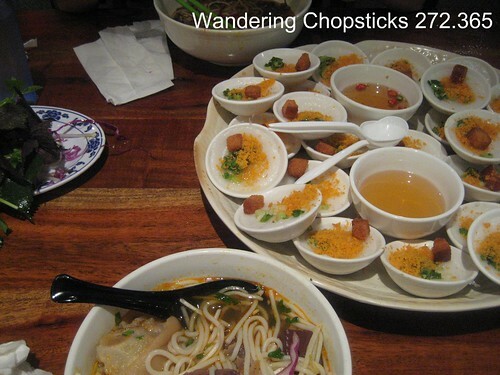 So we met up for dinner at Nem Nuong Ninh Hoa - Rosemead to split a bowl of bun bo Hue, and to each get an order of banh beo (Vietnamese steamed rice discs). 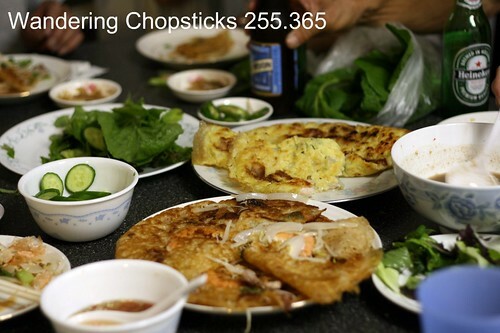 That's a dozen banh beo for each of us. Mmm. It was nice to notice the sunset again instead of working all the time. I hope your September gave you enough time to notice sunsets as well. 2 years ago today, A Tiramisu and a Thank You Dinner. 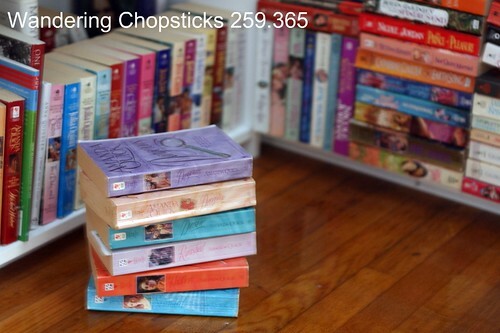 3 years ago today, Part 12 of my "How to Start a Food Blog" series: Measuring Success - Cheerleader or Nerd? 4 years ago today, Uzbekistan - Los Angeles (Closed).